It seems like every time we go to the grocery store one of these cute little pumpkins comes home with us. I’m not ready to cut them up and bake them into pumpkin pies (I doubt I’ll ever be that ready, honestly) and I’m not ready to carve them for Halloween yet either but I have a kid that LOVES to craft so you know what we did? We painted them! In the latest trend of course: Emojis, aka my daughter’s favorite form of communication. First, wash and dry your pumpkins. 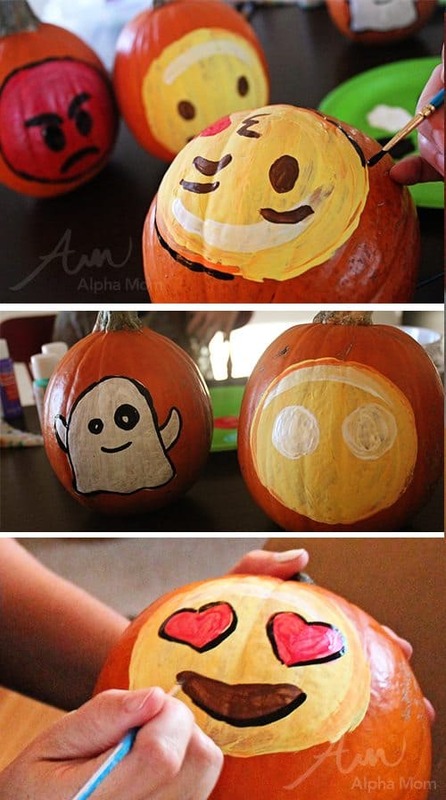 You could add a layer of varnish to your pumpkins if you want the painting to last longer but face it, these are disposable. Halloween is just a few days away. 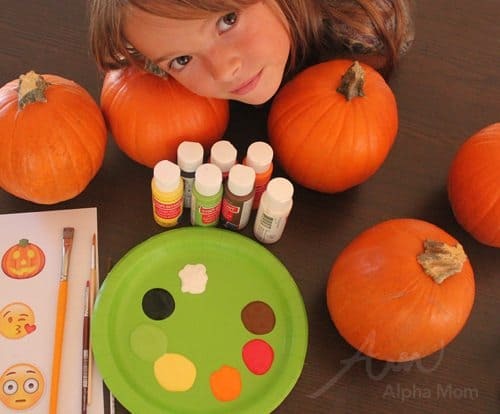 After your pumpkin is washed and dried you can lay down your first layer of paint. In this case it’s the yellow face, white ghost and red face of the angry pumpkin. I used two layers of yellow because my paint went on a little thin and streaky. Paint as many layers as you need but make sure your paint dries thoroughly in between layers or else the paint will pull up the under-layer just like putting on a coat of nail polish before the one underneath it is dry. After your first base layers are dry it’s time to add details! Red hearts, eyes, mouths and then finally some outlines. Real emojis are created on computers so they have lots of gradients and highlights but you can keep your detail simple or go all out. I personally liked to add the black outline to define the edges and cover up some of my smudges. 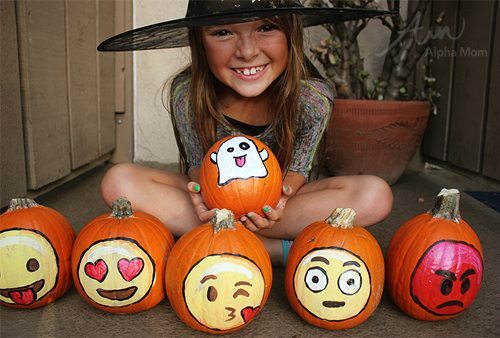 Then set them up along your doorstep (or maybe your Halloween party table) and send a Halloween message! I think our message is trying to say: Don’t eat all your kid’s Halloween candy or a ghost will haunt and lick you to death or something like that….